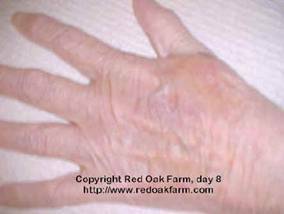 Last Monday I started using the Emu Oil on my skin (I am only 56, but have skin of someone about 80 due to use of prednisone) I'm using it to hopefully strengthen my skin which is very thin, and know this may take some time. But I also started using the oil on a nasty laceration on my leg. The wound/scab is shrinking daily and I haven't lost any of the skin surrounding the wound, which has been the case with two other bad lacerations I sustained. 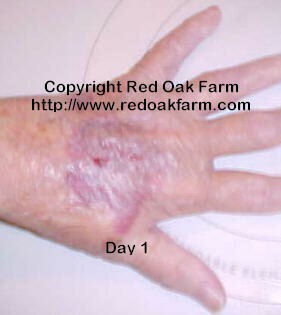 I am amazed as to how well this wound is healing and have to attribute it to the Emu Oil. I just ordered some more on line, as well as a sampler of your super rich moisturizer. Any improvement in the overall strength of my skin on my legs and arms would be wonderful. 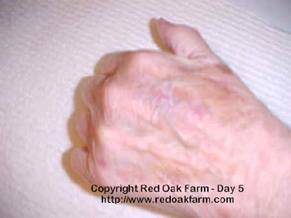 As we get older our skin begins to thin, sometimes it seems like every little bump leaves a bruise -or worse - a skin tear. 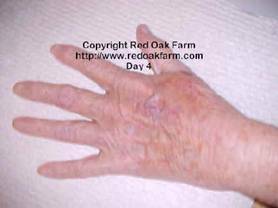 Our Thanks to Red Oak Farm for the use of the information and pictures she has compiled on emu oil and its use on healing thin skin.